Real Estate lockboxes make it easy to show your properties when the seller is away or unavailable. There’s no need for buyer’s agents to travel to and from your office to pick up the key. This convenience will make your listing more attractive and can often differentiate between other properties which aren’t set up with a lockbox. With the high turnover rate of properties and increased workload for real estate agents, lockboxes significantly increase the number of showings for a property. This convenient “gadget” does bring with it some risks, whether you’re acting as the seller’s agent or the buyer’s agent. As a real estate professional, it’s important to keep on top of these risks, to ensure you and your business are adequately protected. When an appointment is confirmed with an agent and prospective buyer, the agent receives the code to retrieve the key and show the property. After the showing, the agent can then lock the property and return the key to the lockbox, which is then available to other agents or people with the required code. The main risk to seller’s agents is unauthorized use of the code to access the property. Potentially a buyer could see the agent punch in the code and go back to a property afterward, or someone else could become privy to the code information at the Realtor®’s office. Older lockboxes out in the weather can also rust and deteriorate, making it difficult to open. Never publish the access code for a lockbox in the MLS — even in the sections that only agents can access. You want to control access to your properties — as well as know who has conducted showings so you can follow up with those agents. Avoid using the old combination or dial lockboxes for homes that are occupied. Use them for bank-owned properties where contractors may need access. 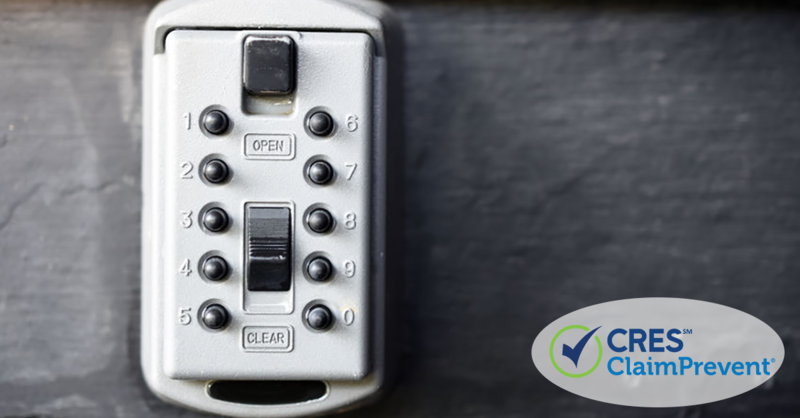 The main risk to the buyer’s agent after a showing is being blamed for damage to the property, or a security breach compromise of the lockbox code allowing an unauthorized third party access to the property. Basic lockboxes typically have either a spin-dial or push-button combination lock. It’s crucial to change the factory settings and create a unique pin number to maintain adequate security. Change the code or combination at least weekly, especially if contractors are accessing the box. Newer electronic lockboxes are growing in popularity and offer enhanced safety. These lockboxes use Bluetooth, and agents can connect to an app to obtain a pin code to open the lockbox. Listing agents can then track who opens the lockbox and when, which is useful should anything go wrong. Several types of lockboxes also allow you to set certain times that your keys can be available — during business hours, for example. It’s best to change the access code after each showing when possible. When using a lockbox as a seller’s agent, explain the risks and benefits to your client. Ensure they sign an agreement confirming they understand that real estate agents and prospective buyers will access their property. It’s also standard practice to include a clause that you, as the agent, are not responsible for any property damage or vandalism. There are many lockboxes available on the market. The iBox by Supra is one such option which uses infrared technology and smartphones to access the keys stored in the iBox container. Agents can point and beam their electronic key or eKey-enabled smartphone at the iBox for access. The iBox enables tracking of access times and dates and identifies the keyholder, and you can restrict when the lockbox can be opened. The technology can also require all showings to be pre-scheduled with the listing agent before access is granted. Sentrilock lockboxes are also popular, with the company being 100% owned by the National Association of Realtors®. This Bluetooth-compatible solution allows agents to open the lockbox with a smartphone or tablet. As the listing agent, you can generate “one-day codes,” and track access through the access log. Changing codes every single day enhances security and reduces the chance of unauthorized entry. CRES Real Estate Errors & Omissions (E&O) Insurance covers Lockbox damage right up to your policy limit. It also gives you protection for other real estate risks you face every day in your business, including lawsuits if a client sues you. You can customize your policy to suit your business. And CRES E&O + ClaimPrevent policies also include free Legal Advisory Services available 7 days a week, so you can get legal assistance before a claim arises. With more than 20 years’ experience working with real estate professionals, CRES has got you covered. To find out more about CRES Insurance or to obtain a quote, contact the team at CRES on 800.880.2747.